"When you see the world in Pyjamavision, everything looks extraordinary! Move the stripy screen over each page and watch the colours and shapes come to life. 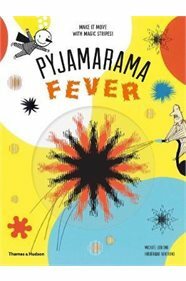 When a little boy puts on his pyjamas and goes to bed, he falls into a dazzling dreamworld of swirling stripes, shimmering spots and other strange sights. Come with him on a fabulous trip where you won't be able to believe your eyes...."